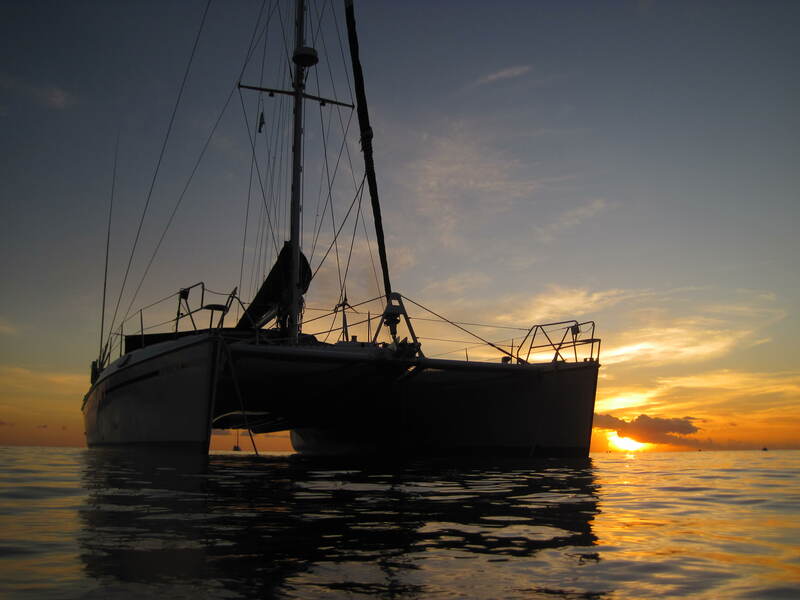 We did a 100 mile sail north from Rodney Bay, St. Lucia to Portsmouth, Dominica. It was a long, non-stop journey totaling 14 hours. The day was perfect for sailing. Winds were 12-15 on our beam for open ocean passing but died down considerably when we were on the lee of Martinique and Dominica below the tall mountains. Along the way, we saw a pod of whales and one gigantic porpoise. The porpoise put on a show for us, catapulting its entire body out of the water to our eye level (at least 5 feet high)! It was spectacular! After witnessing a gorgeous sunset (unfortunately no green flash), it was time to bring in the jib and take down the main and motor the last 4 miles to Portsmouth. We arrived after dark and maneuvered our way in to anchor right off of Big Poppa’s Bar. We were exhausted! Since we arrived after dark, it was a special treat to wake up in the morning and see the view for the first time. Dominica is absolutely one of our favorite islands. The sheer unspoiled beauty of this place is unrivaled. Majestic and lush mountains and rainforests peppered by swaying palm trees comprise the landscape. Very few homes spoil the view. The anchorage is quiet, with only a handful of boats in a bay that is over 5 square miles. Frigates soar overhead as fish continually jump out of the water teasing them. Miraculously, we seem to have relaxed to a whole new level, which who knew was possible after our time liming in Marigot Bay. Clearing in with customs here provided us with some unexpected challenges and entertainment. Since we arrived too late on Saturday, we had to clear in on Sunday- meaning overtime charges and going to their “weekend” offices. Their “weekend” office turned out to be a government subsidized apartment complex! It was a complex of around 10-12 units, each door numbered, but none marked as a custom’s office. We were instructed by the neighbors and random people walking by that we were in the right place, and we should just knock on all the doors until we found the right one! Pirate took the upstairs doors and Cajun the downstairs. After 15 minutes of pounding on doors, someone peeped their head out and yelled something unintelligible and pointed to Door #2. We focused our efforts there and finally a naked man opened the door and handed Pirate a form to fill out and closed the door again. Later on, his disheveled girlfriend opened the door and invited Pirate inside to fill out another form and pay our fees. The “office” was her living room/kitchen. All of the customs forms were scattered about everywhere among their personal items. It was a struggle to clear enough space to stamp and sign the documents! However, they were very nice regardless of the unusual arrangements. Everyone here remembers us from our last visit, Pirate especially. They likely remember him as the Big Man who beat Big Poppa in arm wrestling match. They also know him as an ex-football player and are trying to put together a small party for us to watch MNF at Big Poppa’s tonight. Who knows, we may create a whole new legion of Who Dat fans in this secluded tropical paradise. Go Saints! Previous Previous post: Happy Thanksgiving to all our family and friends. Next Next post: Batibou Beach! Simply Gorgeous!